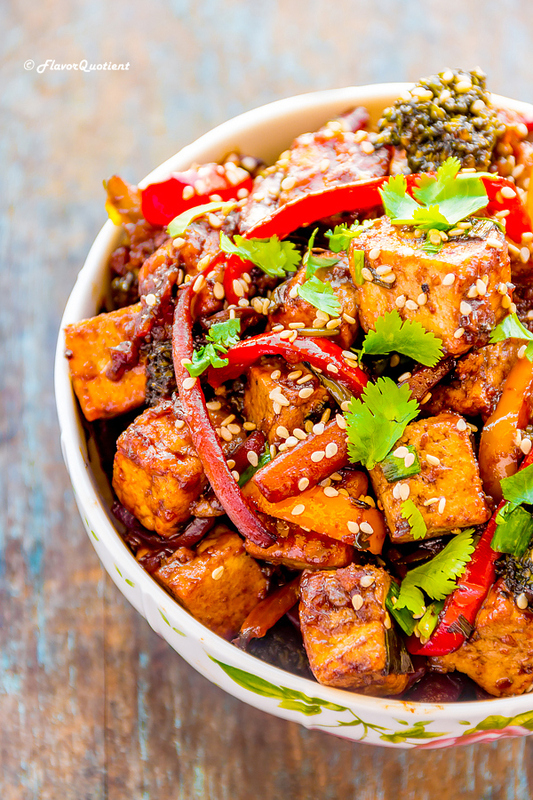 For all the tofu lovers, here is my quick & easy Chinese stir fried tofu recipe! It’s the perfect weeknight meal or take away lunch which is not only tasty but packed with balanced nutrition! If you are one of them who thinks tofu is boring and bland, then come over to me and I guarantee you that I will convert you! I love tofu and after tasting my Chinese stir fried tofu, you will too! This is a quick and simple tofu stir-fry recipe which you may find very similar to what you get in your favorite take-away Chinese joint, but it is guaranteed to be much healthier as you will have the power to decide what goes in it. I love such recipes as this is my ideal quick fix for any weeknight meal. You guys may wonder why I stretch so much on weeknight meal; but that’s simply because being a working woman, I need to be certain about mine and my family’s nutritional demand; that’s why I always try to incorporate quick yet nutritious recipes into our daily meal and bring that to you. Tofu is very high in protein and good to include into your regular diet. 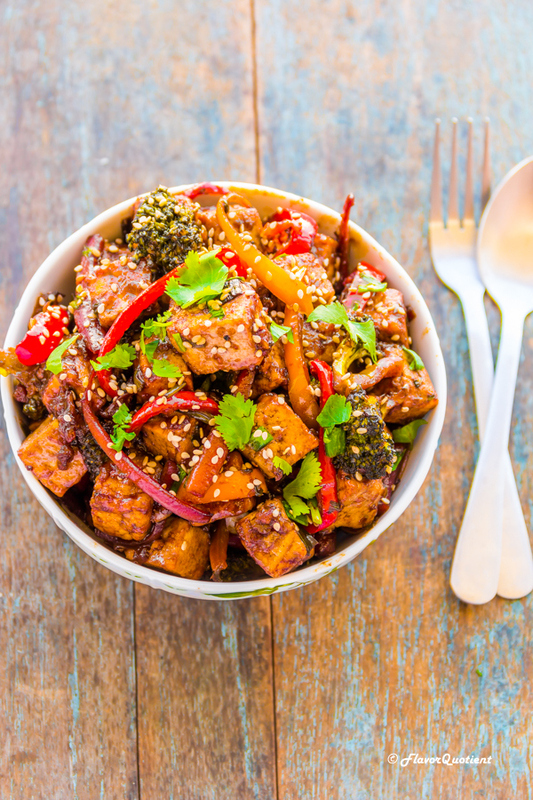 This Chinese stir fried tofu is also a win-win recipe as it fits for the vegans as well. 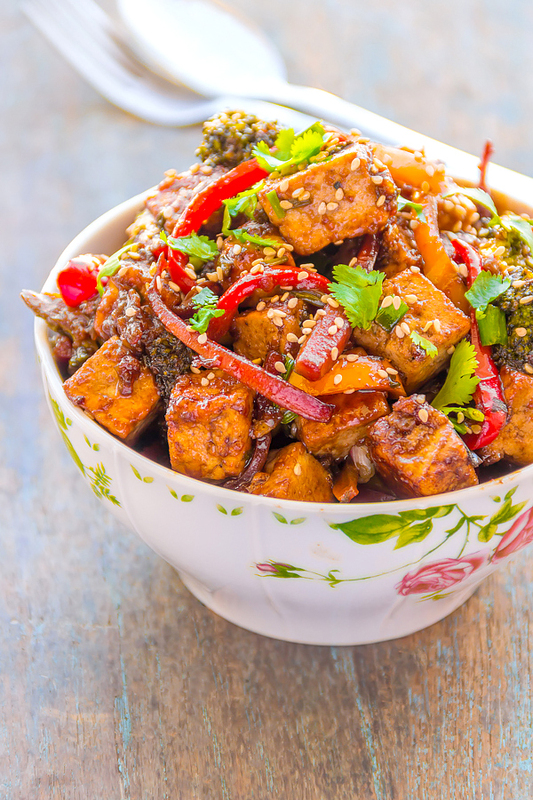 If you are an Indian and also a paneer-lover thinking of substituting tofu with paneer in this recipe, I would request you to refrain from doing so! This recipe tastes best only with firm cubes of tofu and trust me on this – you will fall in love with tofu after trying this. If you still can’t get enough of cottage cheese/paneer, you can explore my blog for ample paneer recipes available here. As you may be knowing that tofu is available in varied forms – firm tofu, extra-firm tofu, silken tofu and may be many more which I am still not aware of. I personally like firm tofu as I feel the flavors penetrate them easily and still they retain their shape and texture as compared to silken tofu which is very delicate to handle. For this recipe, I think firm tofu only is the best option. 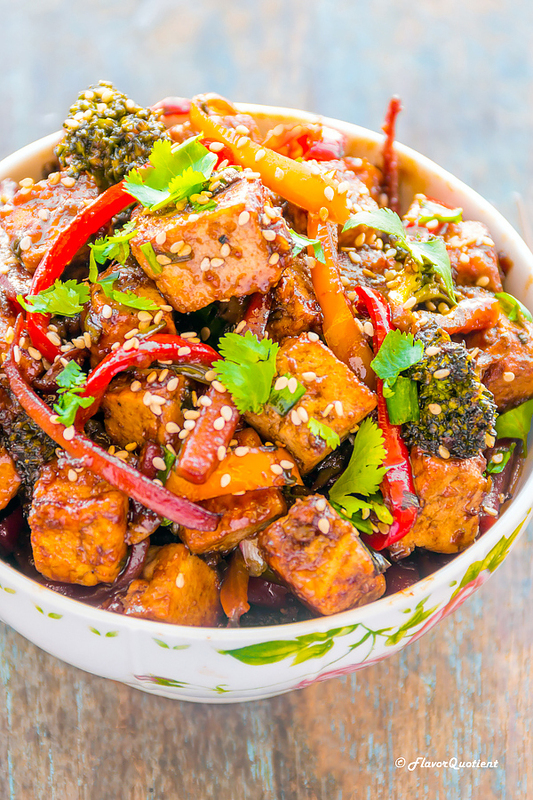 I used my favorite veggies in my Chinese stir fried tofu recipe such as broccolis, carrots and bell peppers; but this recipe can be a great pantry-cleaner at the end of the week where you can use any of your left-over veggies and make a great dish out of it! My affinity towards Chinese delicacies is deep rooted which had set in during my childhood. Street food of my hometown is highly dominated by Chinese food and it didn’t take too much effort to fall for its deliciousness. I can live on all kinds of noodles and chow mein for quite some time before my craving for homely comfort food (read ‘dal-rice’) would creep in. You will find a lot of Chinese delicacies in my blog and that’s simply because I can’t stay without them for long. Today’s Chinese stir fried tofu is another favorite of mine when I decide to go meatless and I am sure you guys will love it too! Cut tofu into 1-inch cubes. Take them in a bowl and add the corn flour to it. Stir the tofu cubes with a spatula to coat them all over with corn flour. Set aside. Prepare the stir-fry sauce by whisking together soy sauce, ginger paste, garlic paste, brown sugar, vinegar, paprika and half of the scallion greens in a bowl. Set it aside. Heat 2 tablespoons of oil in a wok. Add the coated tofu cubes and sauté them until golden all over, about 5 minutes on medium-high heat. Take them out and set aside. Next add the assorted bell pepper juliennes. Stir-fry them on high heat for couple of minutes more. Next pour in the stir-fry sauce and continue stirring on high. Tip in the fried tofu cubes and stir well to coat everything with the sauce thoroughly. Continue stir-frying them until all the liquid is absorbed and coats all the veggies and tofu. Finally sprinkle remaining scallion greens and sesame seeds. Serve the warm Chinese stir fried tofu on a bed of white sticky rice. Enjoy!